Amber is fossilized resin , that had been extracted form the tropical and semi tropical forests which were covered by high trees that had covered a large area and lived millions of years ago. The typical colors of Amber are cognac color , honey color , yellow , red , brown , black , rarely white color , blue and green color. The color enumerate here in before is beginning with common colors and continuing with rarely available colors. The most beautiful samples of the blue amber that takes form rarely are provided from the amber mine in Dominican Republic. The amber oligomiosen in Dominic are 25-40 millions years old. The providing of amber by using primitive methods in Dominic has a past of over 50 years. Amber is naturally a fluorescent material. UV (ultraviolet) When it held to UV weld it shines in the colors yellow , blue , green and orange but the blue Dominic amber is a strong fluorescent. It shows fluorescent characteristic also without additional UV weld. 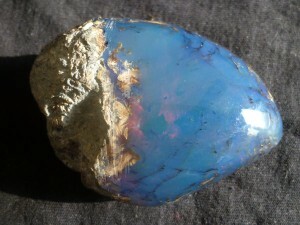 The blue amber had been a fascinating ornament stone due to its showy color , rarely availability and interesting color formation. According to a theory concerning color formation : As the amber had secreted as resin millions of years ago ash and dust that arised in the sky as a result of volcanic activities and they mixed in to the resin and the blue color had taken form in this way.